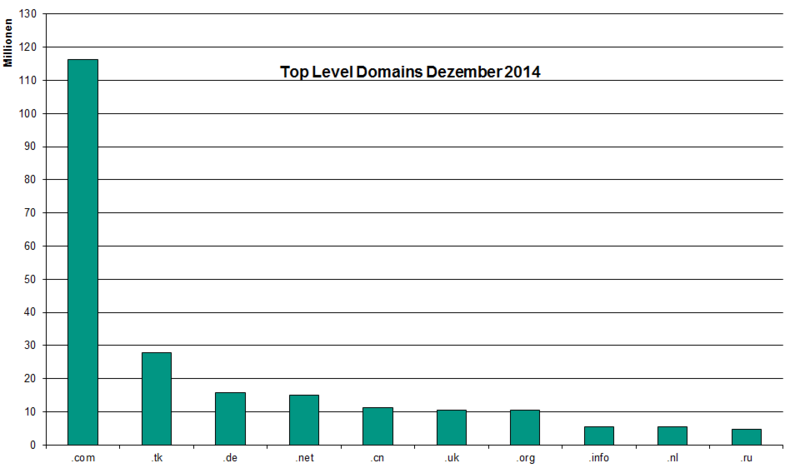 Popularity of top-level domains by December 2014. Image source: DENIC. Right, .DE ranks only #3 in that graph. However, the popular .COM is not a country code top-level domain — although widespread in the U.S., it has no geographical implications. Furthermore, while .TK technically is a country code domain, it is very different from regular ones as discussed by the end of this article. Growth of ccTLD popularity within six months in 2012/2013. Image source: CENTR report 2013. Keeping that pace, it would not take long until .CN overtakes .DE, too. But does the popularity of .CN constantly grow that fast? No. According to this report, it grew by only 1.8 % between May and August 2014. From these data it can be concluded that .CN’s growth rate underlies strong fluctuations. It is still significantly larger than DE’s growth rate, but according to DENIC the absolute difference between .DE and .CN domain registrations was still about 4.5 million by the end of 2014. That is, .CN probably will overtake .DE, but it will rather happen within the next couple of years than tomorrow. Liechtenstein: even more domains than letter boxes? An interesting fact: normalized by population, Liechtenstein holds a record: it has 1.76 ccTLD’s registered per citizen, compared to 0.19 in case of Germany (CENTR report from September 2014). .tk is the country-code domain of Tokelau, a small group of islands and a territory of New Zealand. Domains under .tk are offered free of charge for an initial period. Once expired, they are used for advertising purposes by the registry operator. […] No clear geographical relationship exists between .tk domains and the territory of Tokelau. Tokelau […] is a territory of New Zealand in the South Pacific Ocean consisting of three atolls with a combined land area of 10 km^2. The owner of all free .tk domains is the registry. If you want to own the domain, you must pay. Pricing is from $6.95 per year with a minimum two-year registration period; although domains containing one, two or three characters or those with branded, generic or common words are considered premium and are priced higher. As a result, one sixth of the Tokelau economy consists of income from .tk domain names. The average increase in the latter half of 2013 of 264,000 domains per month is half the average increase of 528,000 evidenced in the first part of 2008. Are you aware of additional interesting insights derived from the development of top-level domain popularity? This entry was posted in General, Technology, The Internet on January 18, 2015 by Jan-Philip Gehrcke. My website is WordPress-backed. WordPress front-ends are called “themes”. There are official themes, released by WordPress/Automattic. And there are thousands of themes released by third parties. While the WordPress project has released many themes, not all of them are equally “important”. There is only one specific series of WordPress themes that is so-to-say most official: themes from the TwentyXXX series. In this series, WordPress releases one theme per year (there was TwentyEleven, TwentyTwelve, TwentyThirteen, you get the point). The most recent one of these themes is included with every major release of WordPress. In other words: it does not get more official. Correspondingly, themes from this series enjoy long-term support by the WordPress project. That is, they retrieve maintenance updates even years after their initial release (TwentyEleven was last updated by the end of 2014, for instance). That is great, really! However, there is one very negative aspect with these updates: there are no official release notes. That’s horrible, thinking in engineering terms, and considering release ethics applied in other serious open source software projects. A theme can be used by other developers, as a so-called parent theme, in a library fashion — it provides a programming interface. This affects many websites, like mine: a couple of years ago I have decided to base the theme used on my website (here) on the TwentyTwelve theme. I went ahead and created a child theme, which inherits most of its code from TwentyTwelve and changes layout and behavior only in a few aspects. I definitely cannot blindly press the “update” button when TwentyTwelve retrieves an update. This might immediately change the interface I developed my child against, and can consequently break any component of my child theme. Obviously, I cannot just try this out with my live/public website. So, I have to test this update before, in a development environment which is not public. If proper release notes were available, I could possibly skip that testing and apply such an update right away if it’s just a minor one. Or, I would be alerted that there is a security hole fixed with a breaking change in the parent theme, and I’d know that I have to quickly react and re-work my child theme so that I can safely apply the update to the parent. These things need to be communicated, like in any other open source project with a decent release policy. Can any one point me to the release notes for 1.2 or a list of the applied changes? Updating from 1.1 has caused some minor, but unexpected presentation changes on one of my child themes, and I’d like to know what else has changed and what to test for before I upgrade further sites. 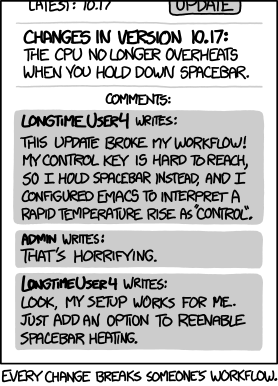 This entry was posted in Software architecture, Web development, WordPress, xkcd favs on January 15, 2015 by Jan-Philip Gehrcke. Randall Munroe’s view on physics is not too wrong. 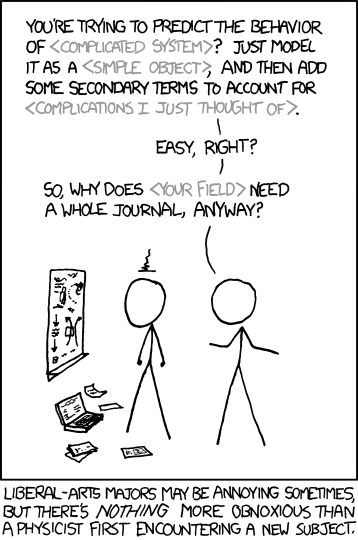 This entry was posted in Science, xkcd favs on January 15, 2015 by Jan-Philip Gehrcke. 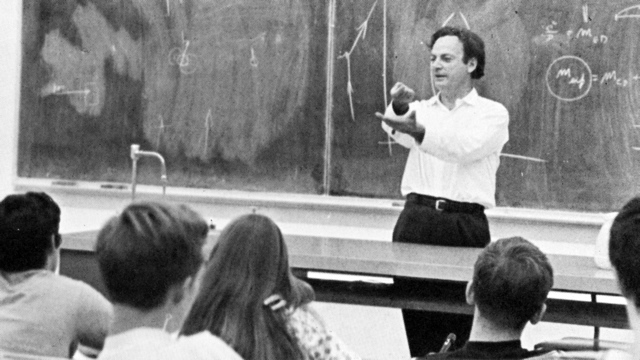 This entry was posted in Science on January 15, 2015 by Jan-Philip Gehrcke.